I have decided to share my sigils in an online sigil portfolio you can find here. A sigil portfolio helps magick as a whole in my opinion. 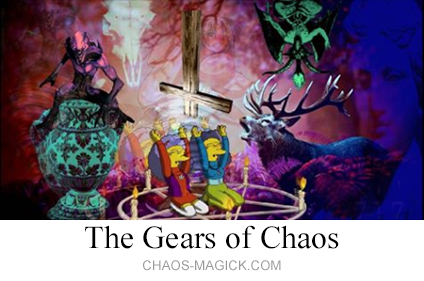 The more sigils that are out there in an image search the more inspiration is available to new students of magick who are trying to figure out how to draw sigils themselves. Also having a portfolio will come in handy if my little black book is ever lost or stolen. Now I will have a backup online. 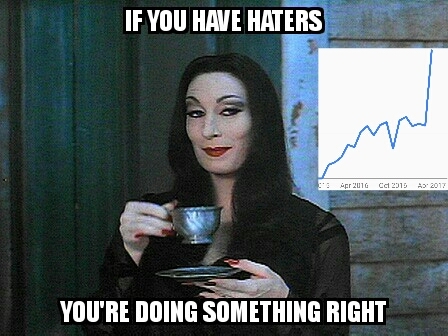 Got my first hater today, it was so cute you guys!!! I just added the ☉ Sun Kamea to the sigil generator. It is a 6×6 planetary kamea which can be used in creating magic squares and sigils. The Sun represents the conscious ego, the self and its expression, personal power, pride and authority, leadership qualities and the principles of creativity, spontaneity, health and vitality, the sum of which is named the “life force”. The word method sigil generator and the magic square sigil generator have now been combines into one tool which you can find here. Some snoo variations I did for r/sigil_compendium just for fun! Update: I have been studying magic square sigil creation a lot lately to improve the function of the sigil generator. The latest thing I have learned is that it’s not just a simple a=1, b=2 mapping which had originally left me wondering: How do I map an alphabet to a magic square larger than 26? I just added the ♂ Mars Kamea to the sigil generator. It is a 5×5 planetary kamea which can be used in creating magic squares and sigils. Mars represents confidence and self-assertion, aggression, sexuality, energy, strength, ambition and impulsiveness. Mars governs sports, competitions and physical activities in general. 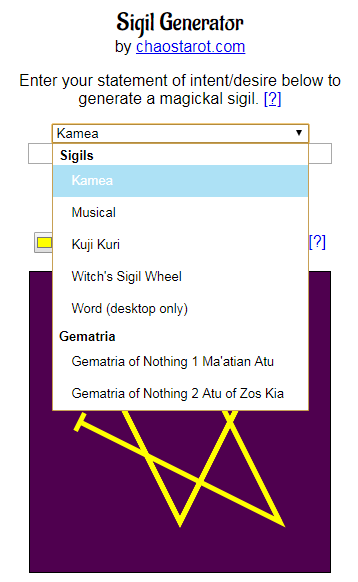 I just added the ♃ Jupiter Kamea to the sigil generator. It is a 4×4 planetary kamea which can be used in creating magic squares and sigils. Jupiter represents growth, expansion, prosperity, and good fortune. Jupiter governs long distance and foreign travel, big business and wealth, higher education, religion, and the law. It is also associated with the urge for freedom and exploration, humanitarian and protecting roles, and with gambling and merrymaking. I just added the ♄ Saturn Kamea to the sigil generator. It is a 3×3 planetary kamea which can be used in creating magic squares and sigils. Saturn represents focus, precision, nobility, ethics, civility, lofty goals, purpose, career, great achievements, dedication, authority figures, ordered hierarchy, stability, virtues, productiveness, valuable hard lessons learned, destiny, conforming social structures, balance, and karma (reaping what you have sowed or divine cosmic justice) but also with limitations, restrictions, boundaries, anxiety, tests, practicality, reality, and time. It concerns a person’s sense of duty, discipline, responsibility, including their physical and emotional endurance during hardships. Saturn is also considered to represent the part of a person concerned with long-term planning or foresight. I have launched a magic squares sigil generator. Right now I only have a 3×3 simple numeric kamea 1-9 as sometimes used by Austin Osman Spare. This is fine for anyone who doesn’t care about the planetary significance, but I will add the planetary kameas next. I also plan to combine this with my word-method sigil generator in the future instead of having separate tools.